Those of you who follow this blog know that I used to invest via Loyal3, a free online brokerage which allowed investors to invest in the stock market at no cost. The "catches" were that it only offered about seventy stocks, it only traded them once daily and you could not name the price you were willing to pay or accept to buy or sell. Unfortunately, Loyal3 went out of business, probably because the ways it was trying to monetize did not provide enough revenue. 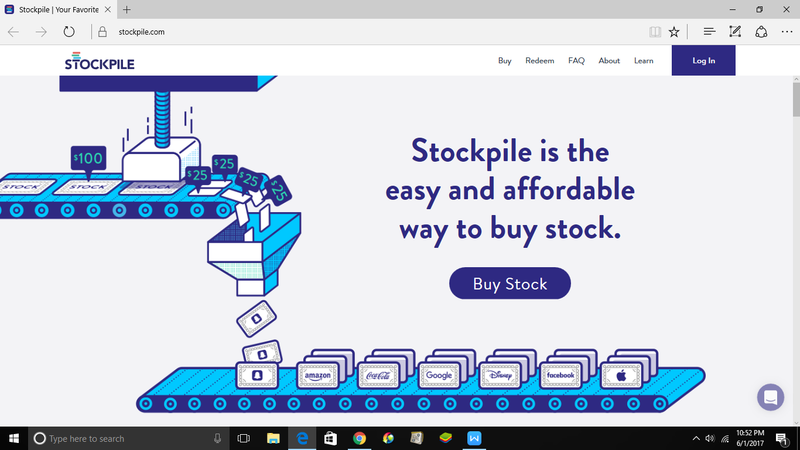 I was recently approached about writing an article about Stockpile, a new online stock broker. After poking around their website and speaking to a representative, I decided to open an account. 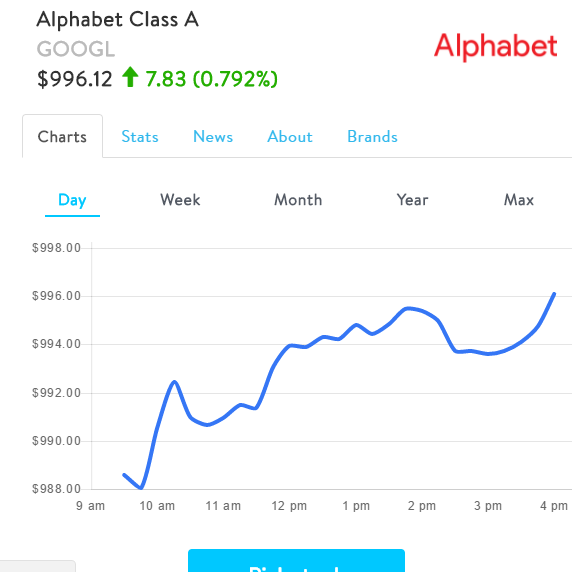 It is clearly trying to get you to push the "Buy Stock" button, and doing so will eventually get you to sign up for an account, but at first it made me think the only way to buy stock was with a credit or debit card. Fortunately, that's not true. If you click on the Log In button it will lead you to register and to link your bank account, if desired. Completing the forms was simple and the requiste micro-deposits were in my account in less than 24 hours. After verifying the amounts, I was all set. I transferred some money into my account and was told I could do so by debit card ($0.25 fee for most debit cards and funds available right away) or by bank transfer (free but it takes three business days). 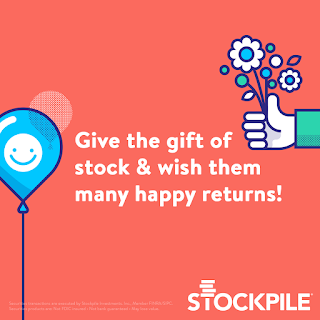 By Purchasing a Gift Card: If you want to give stock to someone as a gift, Stockpile offers both conventional and e-gift cards. You pick both the amount of money you wish to spend and the company in which you would like have the recipient invest. As the purchaser you would pay the fees which are $2.99 for the first stock, $0.99 for each additional stock, and 3% credit/debit card fee. For example if I wanted to give you $50, split between AT&T and Ford, I would pay $5.48 in fees. By Redeeming a Gift Card: If someone gives me a gift card, I can invest the face value in any stock(s) I want, despite what the giver selected. I can also redeem it a retailer gift card if I don't want to own stock. Since the purchaser paid the investing fees, I don't have to pay them. No matter how you choose to pay for your stock, Stockpile sells it by the dollar, not by the share. Investors end up with fractional shares, depending on the cost at the time they invest. Also, Stockpile only transfers stock once per day. Buyers pay that day's closing price for their shares, and that's what sellers receive. While this is fine for people who plan to buy and hold, those who day trade or want to be able to sell within a few minutes will need a different broker. Looking at Stockpile's website, I definitely get the impression it is targeting investing beginners, not long-time sophisticated investors. There are catchy graphics and articles about such topics as "Why Do Stock Prices Go Up and Down?". The articles are short, easy to read and informative. I recommend them to anyone who wants a quick easy way to learn about investing in the stock market. 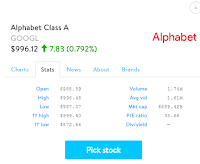 Once you are done learning about the stock market, simply click on "Return to Homepage" to get back to the investing side. On the investing side, Stockpile offers a little information about all the stocks it sells. 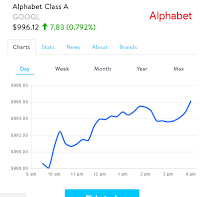 If you click on the name of a stock as if to purchase it, you are shown a diagram of the price of that stock the previous day, week, month, year and for the lifetime of the stock. You can click to Stats and get information like that shown above. 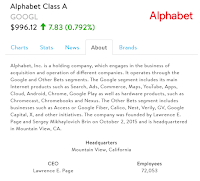 The News tab links to news articles about the company and About gives a short description of the company and its products. Stockpile operates on a per dollar basis rather than a per share basis. 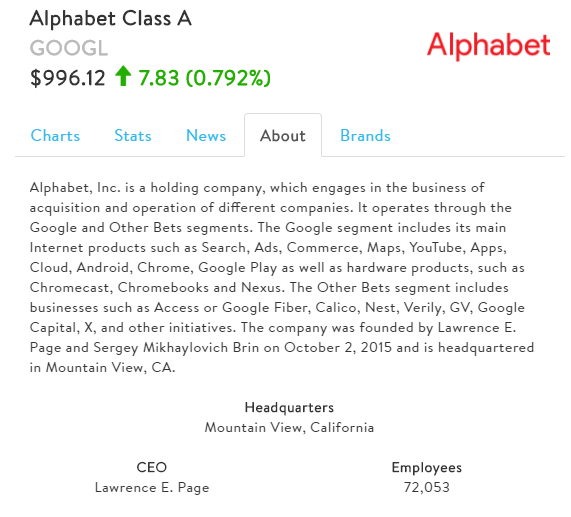 This allows the investment of relatively little money in companies with high share prices. Fees can be low. A quick search told me that the average actively managed mutual fund has a yearly expense ratio a little over 1%, and that index funds are about 0.2%. Those are numbers I keep in mind when considering brokerage fees. If I pay too much in fees, I don't make money. If you purchase $100 worth of one stock from Stockpile using cash transferred from your bank account, your expense will be about 1%, which I think is reasonable for a buy and hold investor. If you purchase significantly less than that, your expense ratio becomes less reasonable. Website is very visual and organized to make it easy for a beginner to use. There are limited choices (though not as limited as Loyal3) and the only thing they sell (at this time) is stocks and ETFs. They do not sell bonds, options etc. They allow you to set up an account for a child, and allow the child to trade in that account subject to your approval. 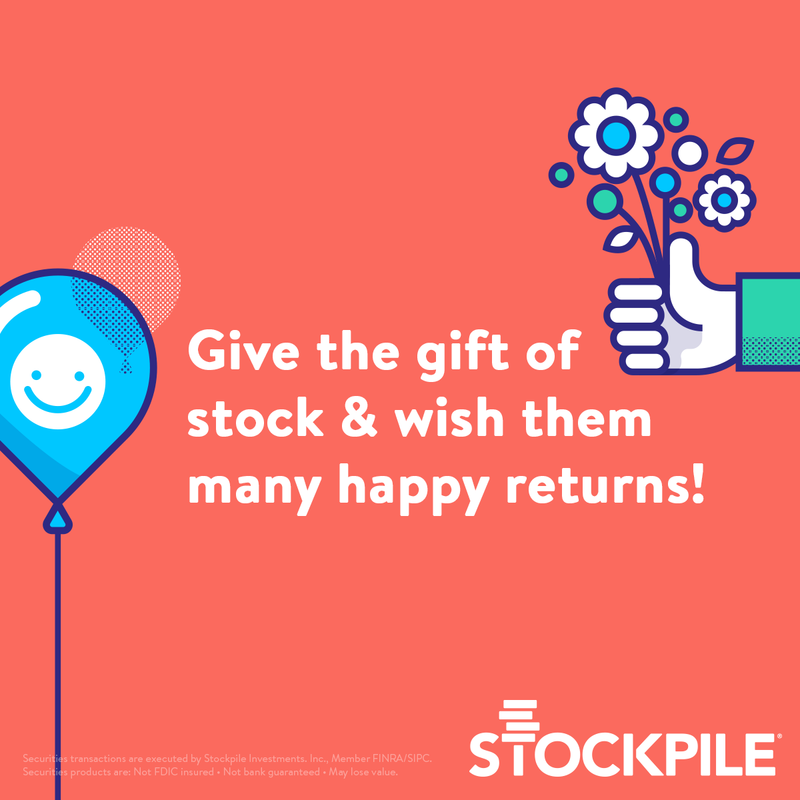 Stockpile makes it easy to give the gift of stock to someone else. Purchases and sales are recorded only once per day, at the closing price. If you hear the market is dropping and you want to cash out NOW, it isn't going to happen with Stockpile. They don't offer every stock (though they have a large selection). They don't offer margin trading, though they do allow you to use your credit card to purchase stock. Stockpile wants to help people learn about the stock market, and what better way than to have some money involved? Stockpile is offering all of my readers $5.00 worth of stock. You never have to buy another share (or fractional share). You know there is a stock out there that you have thought about buying but....well here is your chance. Use Stockpile's money, buy the stock, and if it skyrockets, well, that $5.00 could turn into $50 or $500. If it crashes, well, it was Stockpile's money, not yours. I thought about putting up a Rafflecopter gadget and making you think you had to do all sorts of things for a chance to win this $5.00, but no, it is for everyone, just click here. When you do that, this nice blogger gets paid too. 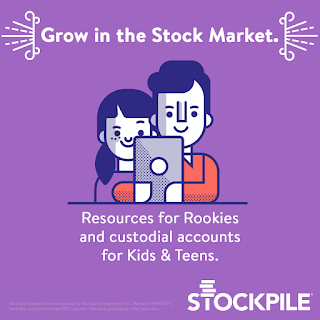 If you are a beginner who is looking for a low cost way to dip your toes in the stock market, Stockpile may be the place to start. Securities offered through Stockpile Investments, Inc. Member FINRA www.finra.org / SIPC www.sipc.org. 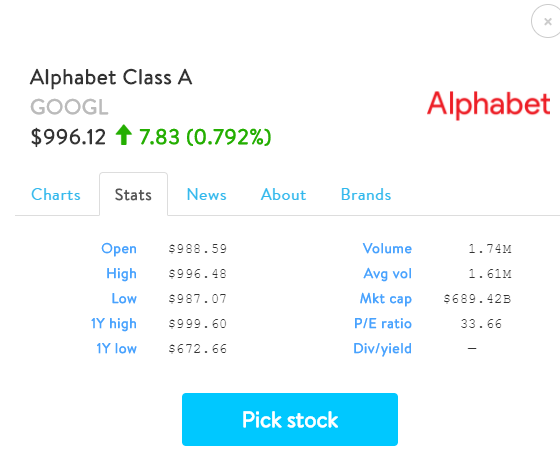 Should I Buy Dividend Stocks or Growth Stocks?